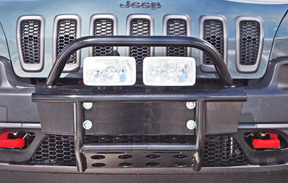 PLEASE NOTE: All bumper kits, brush bar, and light kits can be mounted without having to install a winch. HOWEVER, you MUST order the Winch Mount to install these items. The Winch Mount frame provides the solid mounting points behind your factory plastic bumper. Install a winch, don't install a winch... your choice. 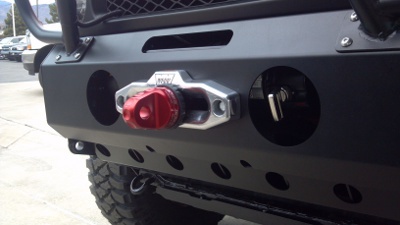 But you MUST purchase the winch mount for any of the bumper accessories to be mounted. Not compatible with SRT8 model. Pictured at left is the Winch Mount kit AND the Brush Bar bumper kit. Click picture for a larger view. As the WK2 Grand Cherokee gains more popularity, more and more of these vehicles are hitting the trails. 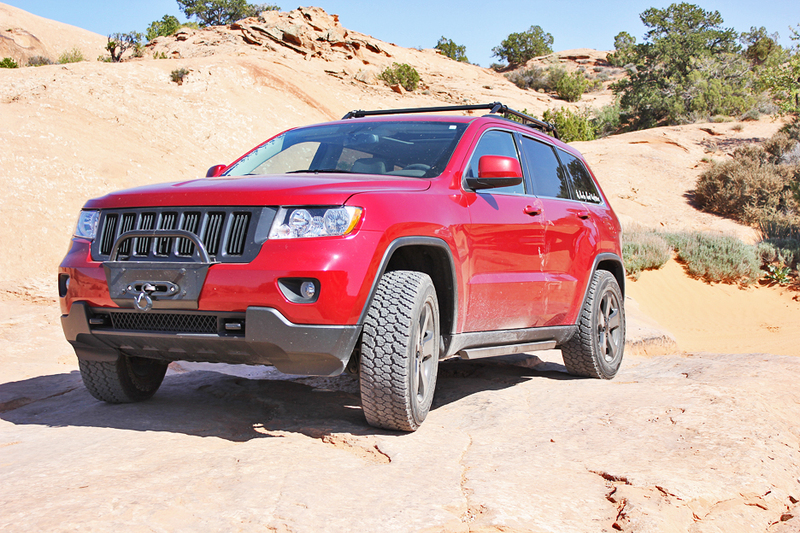 This Jeep has been named the 4x4 of the year by every major offroad publication on the market. There's a solid reason for that... ITS A JEEP! And being that it is a true Jeep, Jeep owners are starting to get the itch to improve, build up, and equip their vehicles for the trail. 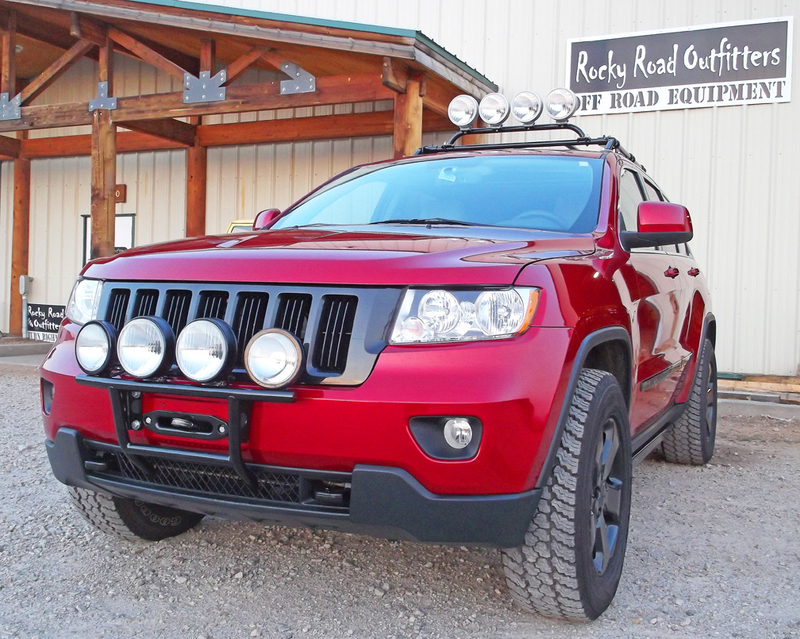 Rocky Road is the first and only company to introduce lift kits, skidplate, rack systems for the new Grand Cherokee, and once again we're the first to provide a true winch mounting system and bumper kit as well. When you're checking out the photos of our awesome looking system, what you cannot see in these photos of the outside of the Jeep is THE MEAT of the Rocky Road winch mounting kit. This is completely tucked inside and behind the factory plastic bumper shell. Your factory plastic bumper shell is currently mounted to a steel frame, which then attaches to the actual frame of your Jeep. Our kit completely replaces that steel bumper frame and provides a new heavy duty steel frame which also includes the new winch mounting provisions. 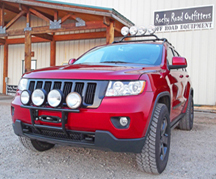 The Rocky Road winch mounting kit comes with the necessary mounting/hardware in addition to the *factory hardware when your stock steel bumper frame is removed and replaced. included in our WK2 Winch Mount kit. The Rocky Road winch mount kit is a full bolton system. No need to do metal-work, fabrication, or welding to your Jeep.... Though of course as you can see from the photos, an opening does need to be cut into the bumper face itself for the winch cable. While this kit is designed to be do-able by experienced at home do-it-yourselfers, having a body shop or mechanic perform the installation may be helpful. The kit includes a detailed instruction manual with lots of pictures to help make the installation run as smoothly as possible. 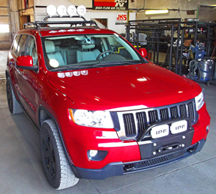 This kit is required to install any of our bumper, brush bar, or light mounting kits. 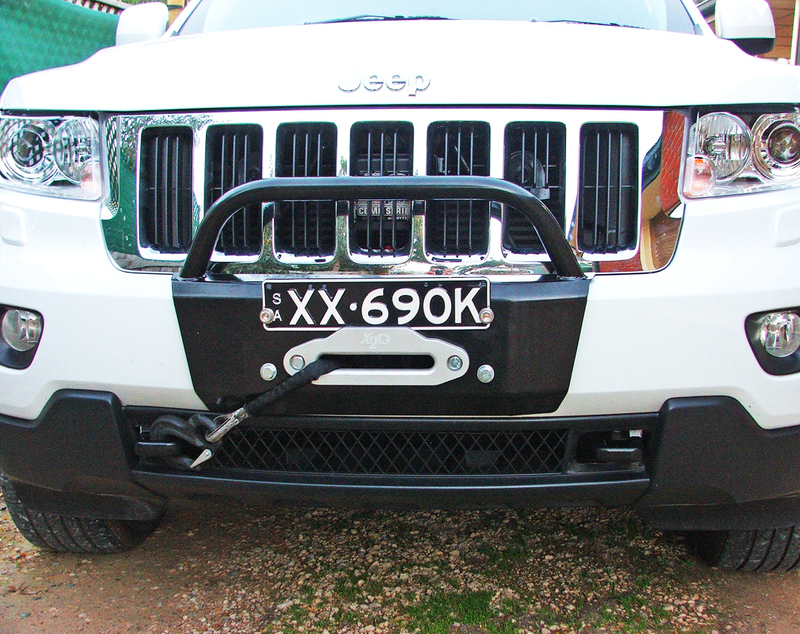 DESIGN: When you purchase this bumper system, you can be assured it's been designed to suit your vehicle. This kit was engineered by hand, and precision cut using the latest CAD equipment, taking all aspects of the vehicle into consideration. The front of the vehicle was carefully assessed to determine the height of the winch, mounting strength, wiring and cooling lines and hoses, vulnerable equipment and panels, radiator air flow etc. Top photo shows the Original Brush Bar kit. Lower photo shows a basic Hawse style fairlead, no bumper mounts. Click the pics for a larger view. QUALITY: The other most obvious feature that sets Rocky Road equipment apart is the quality. Quality of material, quality of manufacture, quality of finish. Our commitment to quality is visible in every accessory we manufacture. FINISH: To ensure your investment is properly protected, all Rocky Road kits are treated with a chemical wash, high temperature powdercoat application, and a sealing system. *PLEASE NOTE: This kit does require the Jeep factory TOW HOOK system. 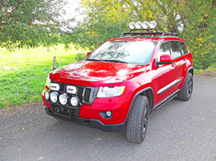 If you do not have the factory Tow Hook system pre-installed on your Grand Cherokee, you can order the kit below with your winch mount system at a discount over what your local Jeep dealership is likely to charge. Also note that ALL AUSTRALIAN, EUROPEAN, Asian, and African model Jeeps will require the tow hook kit be ordered for installation as well. The tow hooks are an excellent system for any Jeep to have anyway, and must be installed at the time of the new Winch Mount system if your Jeep is not already equipped. All kits below can be installed with or without a winch. Without a winch, you do not need to cut the cable opening into your bumper. You MUST purchase the Winch Mount kit though. The Winch Mount provides the required backing to the plastic shell. Without our kit, there is only styrofoam behind the thin plastic shell. 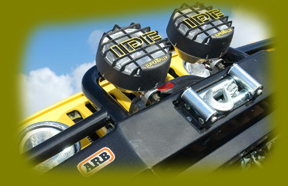 See additional information on our non-winch kits a little lower. Picture at left shows the Brush Bar kit and winch mounted on an ACC equipped Jeep. ACC is the Adaptive Cruise Control system. Click the pic for a larger view! The most popular is our Brush Bar kit. This is the push-bar looking bumper mount shown in the photos above. Not only is it functional as a great brace and impact plate, this awesome push bar on the front of your Jeep will give it a VERY tough offroad look. It really transforms the look of your Jeep from standard SUV, to that of a trail-ready offroad MACHINE... whether you plan to take it offroad or not. Notice below also our 'STR8 PL8' bumper cover which provides a nice solid bash plate up front and solid opening for your winch. Simple, yet a great looking add-on. Along the same lines is our 'Full Bumper Plate' mount which again provides a solid bash plate up front and opening for winch, but also extends and follows the contours of your bumper along the front. 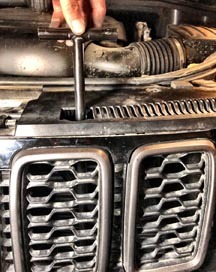 Our 'Light Bar' mount offers not only a great way to mount a host of lights and positions, but also a great looking external brush style push bar off the front of your Jeep. It is combined with our 'Brush Bar' in our ultimate setup... the 'BRUSH BAR COMBO'. 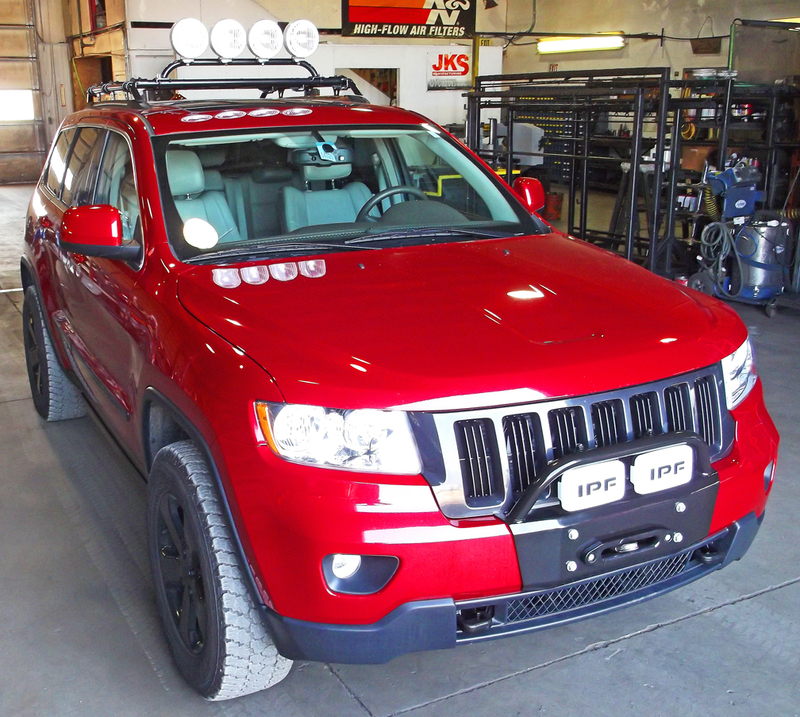 You can see from the pictures that it is a complete overhaul for the front of your plain looking Jeep. 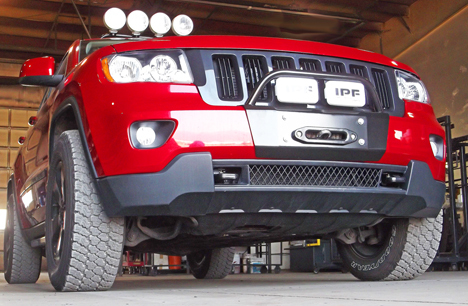 Non-winch Bumper kit with solid facing in front. 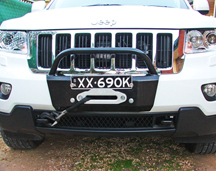 All bumper kits REQUIRE the Winch Mount kit which provides a solid steel backing frame. A winch is NOT required, but the winch mounting kit is. If you intend never to install a winch, order one of our NON-WINCH BUMPER KITS and the oval winch opening hole will not be included. The bumpers will just have a solid bumper face in front. 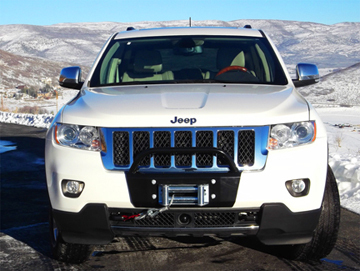 The photo at right is off of a new 'Cherokee', which is why the different looking grill from your Grand Cherokee, but the photo shows our non-winch solid facing for those who do not want the winch. Photos of WK2 kit to be posted soon. Lights are NOT included with any kits. 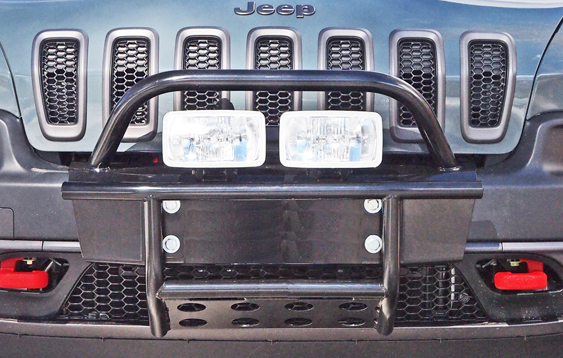 ALL bumper kits shown below REQUIRE our winch mount system (whether you install a winch or not, is up to you). Shows the 'BRUSH BAR KIT'. on it if you wish (lights not included)! yet shown loaded up with 6 IPF lights. Please note: Lights not included. to access the clutch lever on the winch. Required if you do not have tow hooks on your Jeep already & for all, Aussie, Euro, and Asian model Jeeps. Also available from your Jeep dealership.